Occupying the northern end of Parnell Square, the Garden of Remembrance is a memorial to those who gave their lives for Irish freedom. 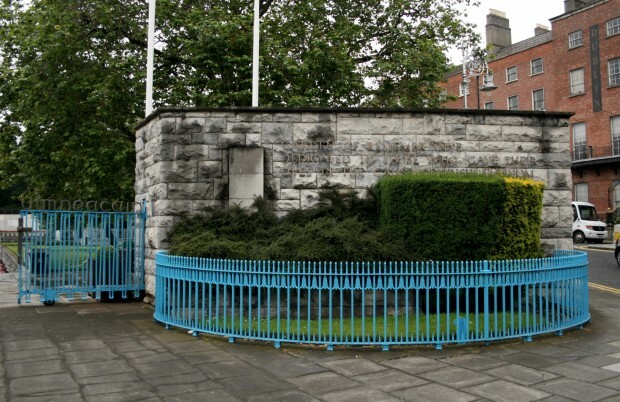 The site had previously been part of the Rotunda Hospital’s pleasure gardens, which opened in 1749 (a year before the hospital’s construction began) with a fee for admission, part of Dr. Bartholomew Mosse’s strategy for funding the hospital. 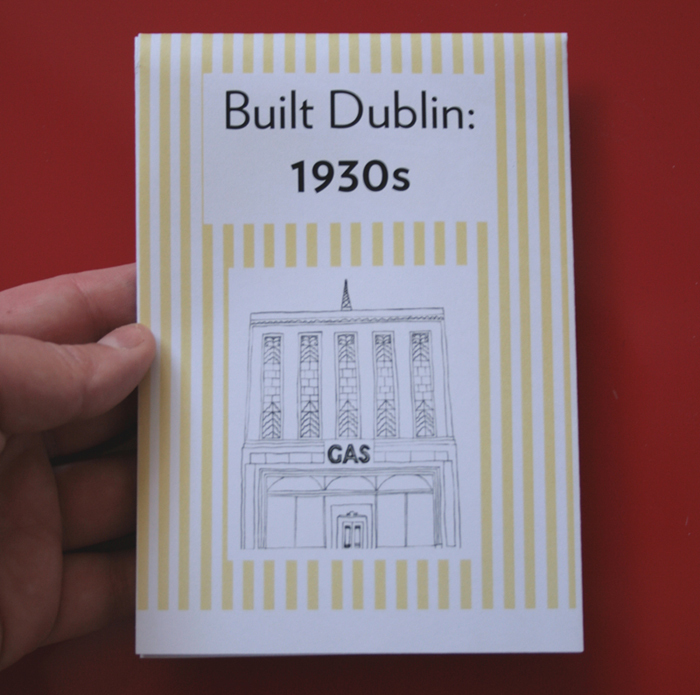 The Dublin Corporation blocks with the butterfly roofs and (in some cases) wonderful mosaics were designed by Hanly, and his huge basilica at Knock may also be familiar to some. I was quite charmed recently, researching for the Dublin Theatre Festival architecture tours, to discover that Hanly had saved and numbered the stones of old Abbey Theatre’s facade on the theatre’s 1961 demolition in the hope that it could be re-erected – though I’d be a long way from what I know of Hanly’s position on conservation, there’s an admirable spirit in direct action. The Garden has raised lawns around a sunken cruciform pit, with a cruciform pool at the centre. The pool is lined with mosaic tiles in a blue and green wave pattern, interrupted at several points by tiled representations of broken weapons, drawing on a Celtic tradition of marking the end of battle by throwing broken weapons into rivers. Around the perimeter of the pit, benches and planted troughs alternate. 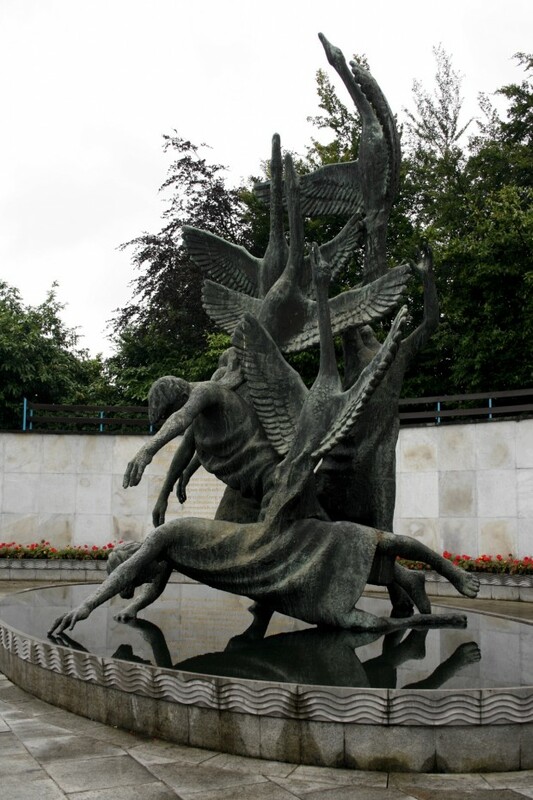 At the head of the cross, there’s a sculpture – Oisín Kelly’s The Children of Lir, added in 1971 – and a poem by Liam Mac Uistin on the wall behind. 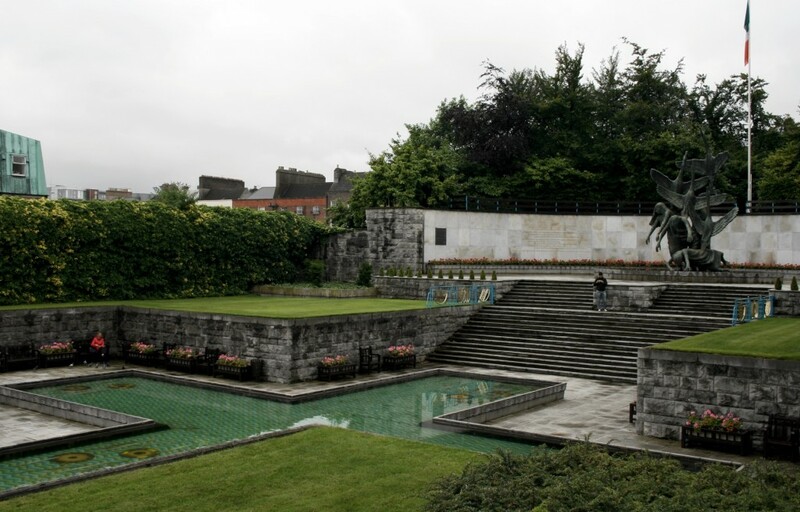 Hanly’s original plan for the Garden had included a sculpture representing Ireland’s struggle, though Kelly’s transforming swans are perhaps more subtle than Hanly’s proposal for Eire and her warriors. Visiting it as a park or garden, it’s hard to get beyond how often it’s near-empty – perhaps it’s because of the huge number of benches, but it always feels very still relative to the busy streets outside. But it feels like a matter of design, too, with the pristine lawns held behind Marian blue fences (set with representations of artefacts from the National Museum), and the rigid formality of the park’s plan directing movement in sharp turns. Appropriately enough, it’s got a sombre military tone, but for me it’s not a cue for reflection, just unease, like being alone at a funeral in an emptied-out swimming pool. 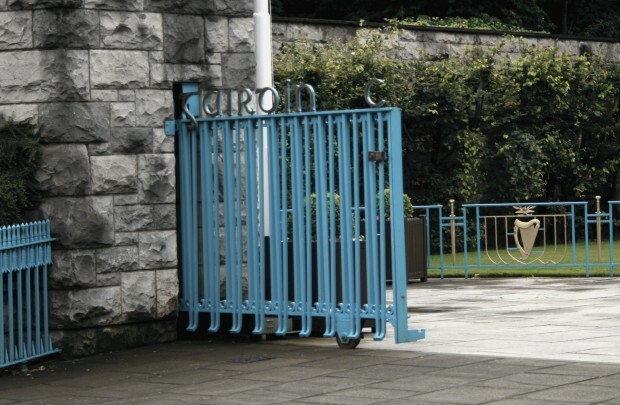 In 2007, an entrance was added to the north, but rather than opening the park up, the overhanging trees and the width of the stairs compound the sense of enclosure and seem poky relative to the other, original entrance to the east. 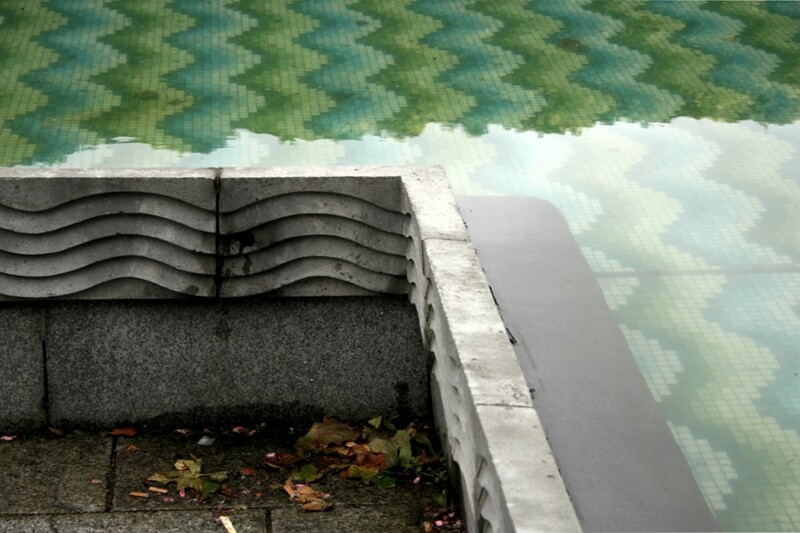 At the same time, it’s a fascinating space. It’s a very specific representation of Ireland and its history, going heavy on Celtic mythology and religious symbolism, and using the rigidity of military plans. Inevitably, something so specific is going to have an immense power for some, and it’s going to leave others (including me) cold if neither religion nor Celtic myth nor the military have any significance for them. And maybe others still are left slightly baffled – a friend of mine, new to Ireland, once described a protest as starting “at that place they turn children into swans.” Memorable, just maybe not always as intended. 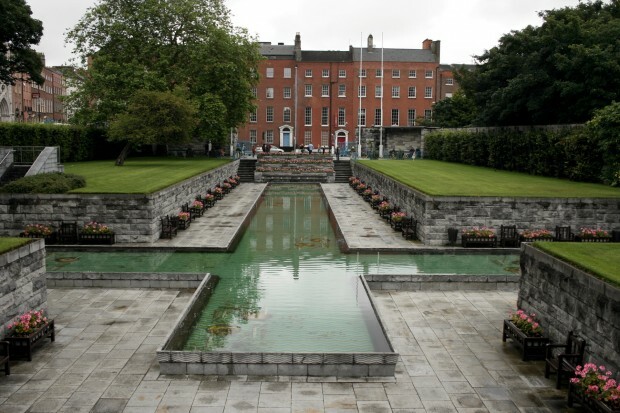 Update: The Garden was also the subject of an application to add a memorial to victims of institutional abuse, refused by An Bord Pleanala. Thanks to Anna Hofheinz (via Facebook) for the heads up.